Having told you recently about highly unsatisfactory places, namely the Midsummer House in Cambridge and the Hotel Du Palais in Biarritz, this week I'm able spread sunshine. I've come across a restaurant that deserves the greatest praise. It is superb, outstanding, incredible and - most importantly - quadruple historic. It's Racine in Brompton Road. It was recommended some time ago by my friend Lord Andrew Lloyd-Webber, who knows a great deal more about food than me. Who doesn't? I never went because every time I go somewhere new it's either too noisy or "so what?" I might never have gone to Racine had I not been heading towards the Ivy one Saturday for lunch when, to my horror, the whole of central London was cordoned off. Barriers were placed across Piccadilly, the street not the round bit, preventing you from going anywhere. This was just to allow some people to parade about protesting. It's ridiculous to shut down a city for that. So we drove back round Hyde Park Corner and west along Knightsbridge until we got to Racine. I would not describe the greeting I received as friendly. A tall French restaurant manager with a beard looked as if I was nicking the cutlery when I dared to suggest we might have lunch. He showed me a back room, which I didn't like. "I'll sit there," I said indicating a centre table in the front room. The Frenchman, Nicholas Minvielle, looked somewhat miserable and said. "You can only have that table until 1.30." It was 12.30pm. "That will be no problem at all," I responded, "as long as I'm served quickly." A bit later Nicholas, who'd partially, but not totally, thawed out, said I could stay longer as many customers couldn't get in because of the traffic chaos caused by the closure of central London. Racine is a jolly bistro-type place. I remember it in the 1950s when it was called the Brompton Grill and had red plush banquettes. It was then owned by a Polish man and specialised in meat. I vividly recall the lamb chops. I used to go there with my parents. Now it's very French and superbly so. I really can't be bothered to tell you what I ate but I should because it looks professional. Suffice it to say I've been to Racine three times and the food was always fantastic. Tasty, not too messed about, original, delicious. The last time I took Sir Michael and Lady Caine and they loved it. Michael said it was the best steak he'd ever had. He also commented, correctly, that the customers looked bright and interesting. Which is extremely rare these days. All right, I'll tell you some of the things I ate. On my first visit I noted how excellent the bread was. That's always a good sign. I had deep fried brain with sauce gribiche then I had ox tongue sauerkraut beetroot and horseradish puree. The fried brain was delicious. The tongue was perfectly cooked and they gave me a spoon for the sauce, which was useful because it was marvellous. When I went with Michael Caine I had roes on toast to start plus some herring and a pepper steak. It was perfectly prepared and professionally presented. On my second and third visits, which were for dinner, I met the owner, Eric Ganier. He was considerably more welcoming than Mr Minvielle even though Mr M cheered up a lot by the end of my first visit. 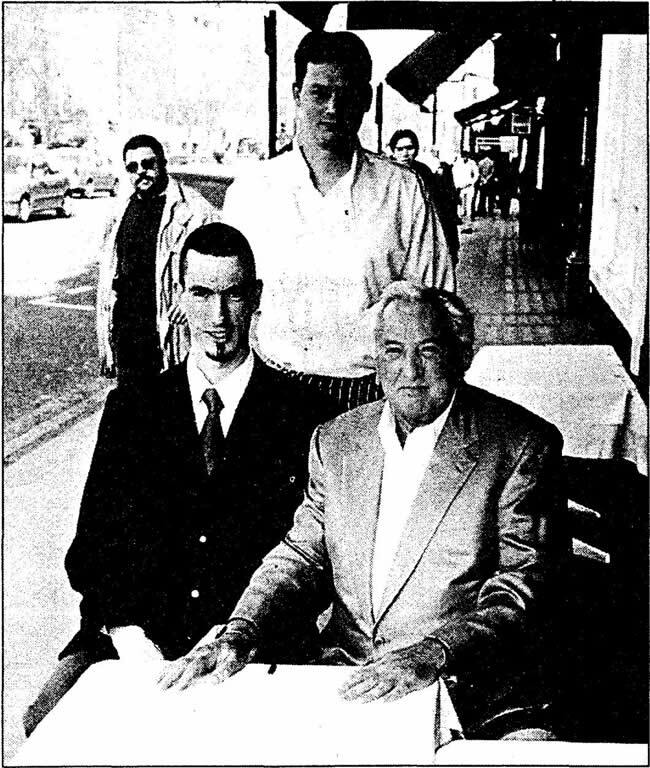 Eric had been at Fish and the Bank and was a director of Bibendum when it first opened. He works very hard in the evening, changing table clothes, hosting and generally doing what highly professional people do. He should be proud of himself. Racine is a considerable achievement. The only slight disappointment was the dessert on my ﬁrst outing. It was a Mont Blanc. I consider myself a world expert on Mont Blanc. I could do Mastermind on it. It's gone a bit strange now, but that and Come Dancing were always my TV favourites. The chestnut was a little too tart, although it was in lovely squiggles as it used to be at Fortnum & Mason. They once did the best Mont Blanc ever. The base of Racine's meringue had become a bit clingy. I'd rate their Mont Blanc "just good". Everything else at Racine is brilliant. On my first visit the sous-chef. number two in the kitchen, was in charge. He's a nice man called Chris Handley. We went with Nicholas to the outside tables for our photo. It was taken on my Leica but with rather old Agfa film. It's essential I give you all the really important information. I generally find Leading Hotels of the World members deserve their accreditation. However, I wrote with a complaint to Jean-Louis Leimbacher of the Hotel Du Palais in Biarritz. When I had no answer I followed it up with a second letter. Again, no reply. So I wrote to the chairman of the Leading Hotels of the World. He didn't bother to reply either. I hope your article last week wakes them up! Bang on target over Biarritz, Michael. We've never cut short a trip before but did after one night at a noisy, scruffy three-star hotel there. At dinner in the main square our starter came on the same plate as the main course. We were told this was "normal". My family spent a very enjoyable week at the Hotel Du Palais at the same time as Michael Winner. My only complaint was our poolside view being spoilt by a semi-naked Mr Winner parading in his faded shorts. Also, if he'd only had one cabana there might have been one left for us! Our experience of Harry's Bar, Venice, was very different to Susan Belford's (last week's letters) The waiters were welcoming and charming and the food, dare I say it, memorable bordering on historic. Mind you, our reservation was made by the concierge at the Cipriani and MW was residing there at the time. Perhaps they were making a special effort just in case? I doubt whether Susan Belford has ever stayed at a Scarborough boarding house or shopped at Marks & Spencer if her condescending criticism of Harry's Bar is anything to go by. Then there was your tirade about your unfortunate stay at the Hotel Du Palais, which must have cost you an arm and a leg. You wealthy folk don't seem to be getting full value for money these days, do you? Your August 17 review is right. Midsummer House is pretentious and serves mediocre food tarted up. The best food around Cambridge is at the Tickell Arms, Whittlesford. If you're not impressed I'll pick up the bill!